When is Passover? In 2017, Passover begins on the evening of Monday, April 10. Feel free to watch our online Passover seder from 2010 and 2011. You can also play with our super cool Design It Yourself Matzah Matzah (Wo)Man game. 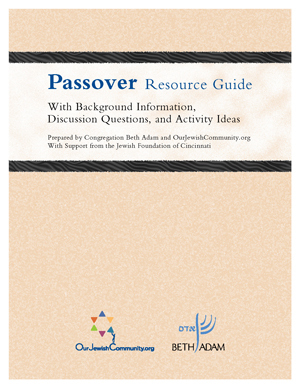 Here are some great Passover resources! What’s on the Passover seder plate? For more Passover and other recipes, visit our cookbook. Follow Elijah on his journeys here. If you have material you would like to contribute to our Passover section, please email Rabbi Barr. We want your participation as we build our online synagogue! 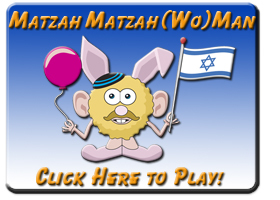 Click the button to play our new “Matzah Matzah (Wo)Man” game! When does Passover begin in 2018? Sunset of Friday, March 30. When does Passover begin in 2019? Sunset of Friday, April 19. When does Passover begin in 2020? Sunset of Wednesday, April 8.